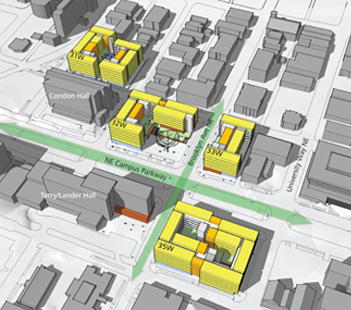 This predesign study addresses a fundamental shift in the University of Washington's housing policy. Its goal is to "provide quality housing for its freshmen enrollment while creating a four-year live-on campus culture." 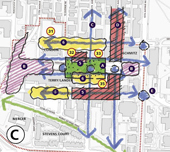 The plan calls for 1,750 Phase 1 beds on four city blocks in the urban West Campus. Future phases will add approximately 850 beds on two more city blocks and will renovate all the existing residence halls. In addition to the housing, the program includes a wide variety of support functions—an urban grocery store, cafe, wellness center, shared-use theater, classrooms, and meeting rooms—to enhance residential life and contribute to a vibrant neighborhood. Careful placement of these functions at the base of the renovated and new facilities will establish the West Campus as a student village, ultimately serving as a home for nearly 4,500 students. Co consultants: Coughlin Porter Lundeen, structural engineering; SVR Design Company, civil engineering; Gustafson Guthrie Nichol; landscape architecture; Rider Levett Bucknall, cost estimating; Hefron Transportation; transportation and traffic; T.A. Kinsman Consulting, code consulting.